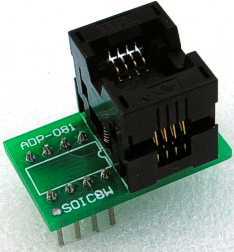 SOIC8-DIP8 adapter (~200mil) will work on all programmers. Supported 8 pin body width 5-6mm (200~209mil)SOIC8 chips. Such as PIC12CXX, SST25VF016, SST25VF040, SST25VF080B, Atmel 24C1024, Winbond W25X80, MX25L1605D-M2,MX25L8005D-M2,MX25L3205D-M2 and other all 200-209 mil body width SOIC8 chips.